What would be a good pre amp to match with a McCormack DNA .5 amp? I will be getting a McCormack DNA .5 Deluxe Rev B power amp in the near future and would like suggestions on what would be a good pre amp to match with it. I currently have a Parasound P/LD 1500 pre amp (which was just repaired but will need additional work). How would that match with the McCormack DNA .5 amp? The Parasound P/LD 1500 is a very well-regarded (and fairly rare) pre amp (it is similar, but the model below, the legendary P/LD 2000 pre). I have been looking at the McCormack RLD 1 pre amp as a possibility. What other pre amps would match well with the McCormack DNA .5 amp? My budget has taken a few big hits lately but let's say it will be in the $500-$700 range...hopefully, but I know that still limits things. take a look, and with a ton of tubes. Thanks. That looks very nice and I have read that tubes match well with McCormack amps. However, I am not sure I want to go down the rabbit hole of tubes...that could get expensive pretty fast (swapping tubes, etc)...but I will keep an open mind and consider both ss and tubed pre amps. Thanks again. I have had both the McCormack DNA 0.5 Rev B paired with the Eastern Electric Minimax preamp that @Marvda provided the link too. You would do yourself a favor as these work very very well together. It doesn't have to be an expensive proposition as it take only 3 tubes that are readily available. You only go down the rabbit-hole if you want too. Also that link looks like the seller is including about $500 worth of tubes with the sale. If it's in your budget, you should run to make that deal IMO. Just wait....see how you like the Parasound with it. You may not want or need to spend more. If you do though, go the tube route. 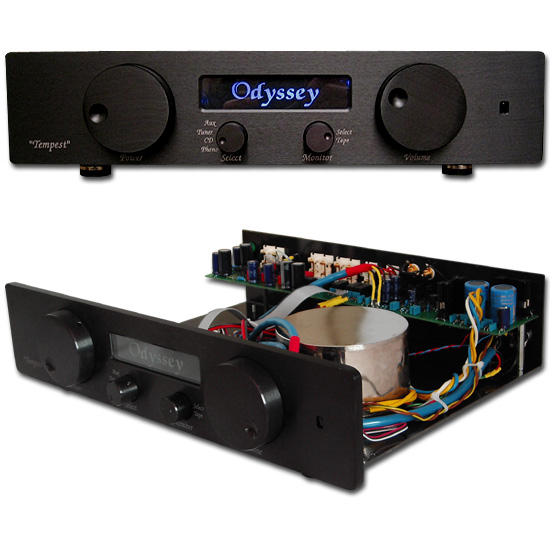 Solid state Pre amps in that price range are not going to be too much of a difference sound wise. Thanks. It sounds pretty great. Not knowing much (or anything) about tubes, or that specific tube amp, please file the following under "stupid questions:"
(1) Do tube amps/pre amps need time to warm up before playing orr can one just flip a switch like on ss equipmet and begin playing music? If they need warm up time, how much time is needed on average before one can start playing music? (2) I assume that the tubes get warm/hot. If so, how much room in a rack would they need to "breath." In other words, could I put this tube pre amp in a middle shelf of a rack with an inch or two of clearance at top or would it have to go on a top shelf of a rack, or on a shelf with much more clearance (how much inches of clearance would it need if it went on a lower or middle shelf of a rack?). (3) could I connect an external phono pre to this pre amp? (assuming I am correct that it does not have a built-in phono pre). I read the links to reviews which marvda1 provided and it seems like a fantastic piece. Thanks. 1. the hotter they get the better they sound. solid state needs to also warm up. 2. as long as they are not touching anything, these are small siginal tubes that don't get anywhere near as hot as power tubes. 3. looks like it has 3 inputs and 2 outputs so you can connect a phono pre. I will have to politely disagree with you there Tony. To me, the Cary CPA-1 was leaps and bounds above a similarly priced (usually higher priced) Parasound P5. If anything, it would give you a nice "baseline", and then you could determine what direction you want to go in from there. Yes, there are exceptions, and the Cary is certainly one of them. Also, tube gear isn't as expensive as you think and tubes can last years without ever having to touch/change them. The difference is, with tubes you can tailor the sound to your liking. With SS, you get what you get. Some cheap brands to get your feet wet with tubes in your price range is Yaqin and Dared. Many here cut that tube cloth on those 2 brands. Thanks marvda1, tonyb, clipdat, and halo (and anyone else I may have missed), for all of the info and recommendations. It is much appreciated. Thanks, gmcman. I actually contacted that Seller yesterday. He has the same pre listed on eBay for $590 or best offer. He said the pre has some cosmetic issues and I really did not get a good vibe after talking to him. There is actually another RLD 1 (in better condition, listed as mint, and less expensive, $500) listed on U.S. Audio Mart but that seller is a real jerk. He is also selling a DNA 1 Deluxe amp and I inquired about that amp, as well as his RLD 1 pre, a week or two ago. I thought about getting his DNA 1 Deluxe but, in the end, decided to get a DNA .5 which I found from another Seller. When I got back to him and told him I decided to pass on his DNA 1 Deluxe but was still interested in his RLD 1 pre he became very rude (all via e-mail), accused me of trying to get a lower price from him because I went to another Seller (which I never did; I offered him his exact listing price), and refused to sell the pre amp to me because I would not buy his amp as well (although he clearly stated in his posting that he would sell the amp or pre separately). I emailed the Seller of the Eastern Electric MiniMax pre at 8:30am today and asked him how much shipping from Canada would be. He merely responded that he was at work and did not know. About 2 hours later I noticed he had also listed it on eBay yesterday for $103 more than his asking price on Audio Circle ($903 vs $800) and had listed a $63 shipping price to the U.S. on his eBay listing. I emailed him again and told him I just noticed his eBay listing and once more asked him to provide me with a total price shipped. Hours passed and no response. About an hour ago he emails and says "sorry, it sold on eBay this afternoon." I do not know why he could not answer my questions this morning about price and shipping cost. I have only recently expanded my search to sites and Sellers outside of this forum and my experiences with a few Sellers on other sites in the past 2 weeks, including the one today, just reinforces my belief that this site is the best audio site, with the most generous and informative and sharing people...and the Flea Market is a treasure for all of us. Thanks. I sell equipment on various forums from time to time and may be able to shed some insight. Ebay kills sellers with fees. They take 10% of sale and another 10% of shipping cost. That's probably the reason for the higher sale price. Also in order to provide a shipping quote one must measure the box and know the weight and then find out the cost to ship to your specific location. If someone is at work, they may not be able to accomplish that at that time. Polk flea market, us audiomart, audio asylum are sites that don't charge fees to sellers and therefore you may get a better price in negotiation than say ebay or Audiogon. $800 (if it included all thos tubes) was a very good price. 1. Power amps require much more maintenence and attention than pre amps. 2. All equipment operates and sounds better after a little warm up time, but tubed pre amps can be played when you switch on....takes only a few minutes to get warmed up. Most of your concerns about tube amps are really only concerns for power amps. All tubes get warm/hot to the touch but you don't need as much clearance for tube pre amps b/c they use small signal tubes. Sorry about slow response. I still have an Eastern Electricmini max pre and will not part with it because pound for pound it is a great deal. When you switch the tube in the middle it will modify the sound as different tubes have different sonic characteristics. This allows you to fine tune the sound to your preference. This is referred to as tube rolling. Shameless plug for my own Audible Illusions Modulus 2. It's an older piece but is damn fine sounding. I have both an Odyssey Candela and Tempest for sale. The Candela might be listed here somewhere. The Tempest is a recent thought. Long thread and I didn't see your price point specified. Only reason for those sales is all @VR3 's fault! I'm the original owner of both, both purchased new from Klaus within the last 5 years. Someone mentioned Schiit - yep, that darn Saga is still blowing my mind. Anywho… if interested PM me and we can work out which works best for you and a pricing agreement. Thanks for all of your suggestions and information. I ended up getting an Eastern Electric MiniMax from a PF member. He shipped it today so it should arrive in a few days. I am excited...my first venture into the world of tubes..and I think it will be a great match for the McCormack DNA .5 Deluxe power amp. Thanks again to everyone on this great forum for your advice...I had never heard of the MniMax before until it was mentioned on here...which made me do a lot of research into it...and then a fellow Polkie pointed out to me another member "who had one he might want to part with it"...and voila...deal done and the EE MiniMax is on its way. Thanks again to everyone for your assistance....and also for helping me spend way more money than I expected to, ha. But I know it will all be well worth it in the end. The rabbit hole is definitely deep but it also has great imaging and soundstage! Very nice. I'm glad that a Polkie stepped up and parted with a very special piece, in order to further enhance your listening enjoyment. Pretty cool man. Glad it worked out for everyone involved. Congrats and enjoy!